It’s always hard to write relay recaps because so much happens in such a short amount of time and by the time I get around to writing these things, I forget half the stuff we did. Also as our lack of sleep increases, the more cranky delirious everyone gets. Team 36 legs and 24 shoes rocked it from Mt. 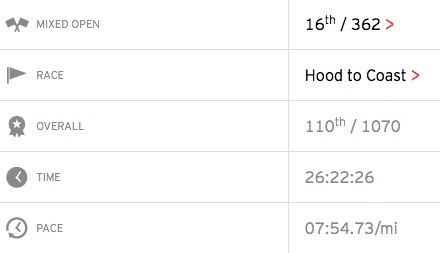 Hood to Seaside in Oregon (200+ miles) for Hood 2 Coast. Can you guess what our team color was? 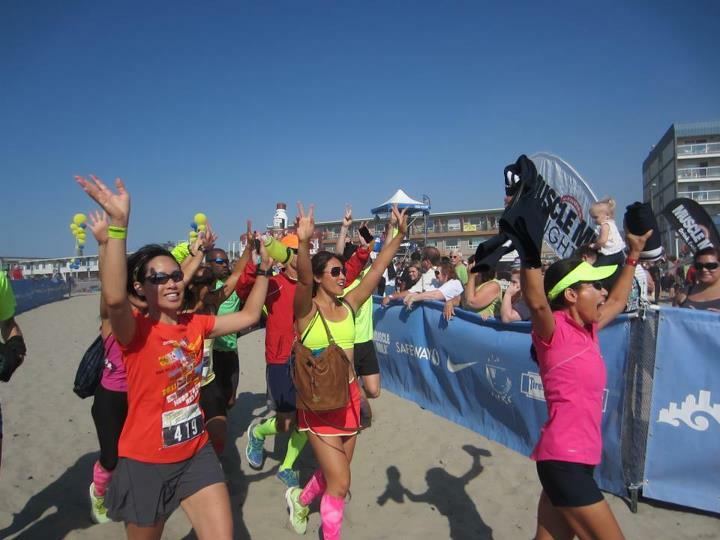 This race has been on our bucket list since when we didn’t get into the lottery last year. Fortunately, the lottery gods blessed us with a entry this year, so I quickly scrambled together a team of 12 amazing runners/friends. 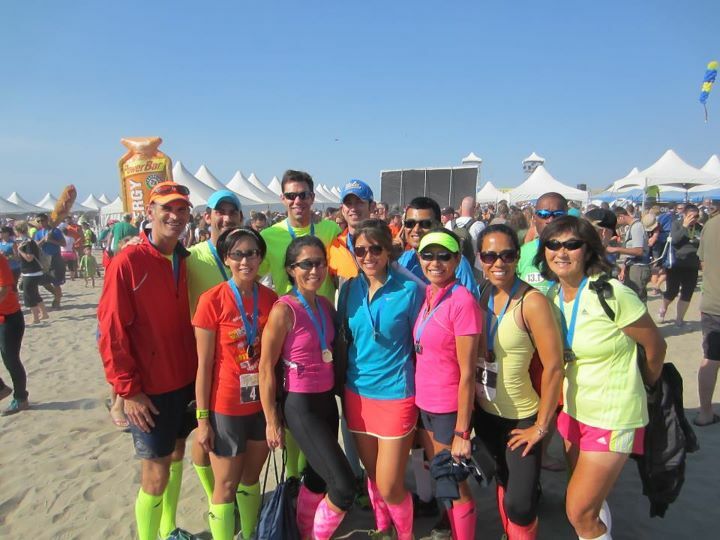 Hood 2 Coast is the largest relay in the world with over 1,000 teams with 8-12 people on each team, that’s a heck of a lot of people. Compared to the Ragnar relays, this one is the grand daddy of all relays. We flew up Thursday to Portland, stayed near the airport and made the 2 hour drive out to Mt. Hood Friday morning, after much vandalizing decorating of the vans. 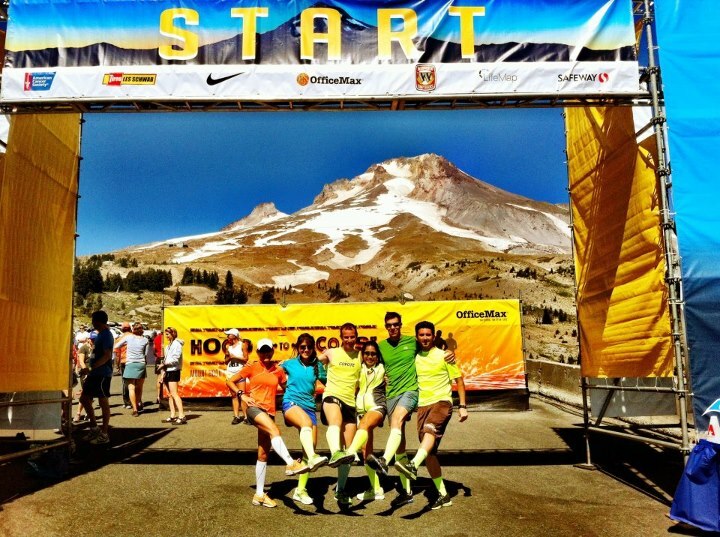 It seemed like the theme for Hood 2 Coast this year was joking about everyone’s third leg….no comment. We didn’t get the early start like we hoped for but didn’t think traffic would be nearly as bad as it proved to be later on in the race. Our van had some pretty speedy times due to the fact that we dropped major elevation from 6000 feet to below 1000. It was easy navigating our way to each other’s legs because we were mainly on Highway 26 for the whole time following the runners. Like most of the relays I’ve been involved in, I’ve learned that you don’t get as much downtime as you would think even though we’re waiting for 11 runners to cycle through. That’s what happens when your entire team is full of fast runners! 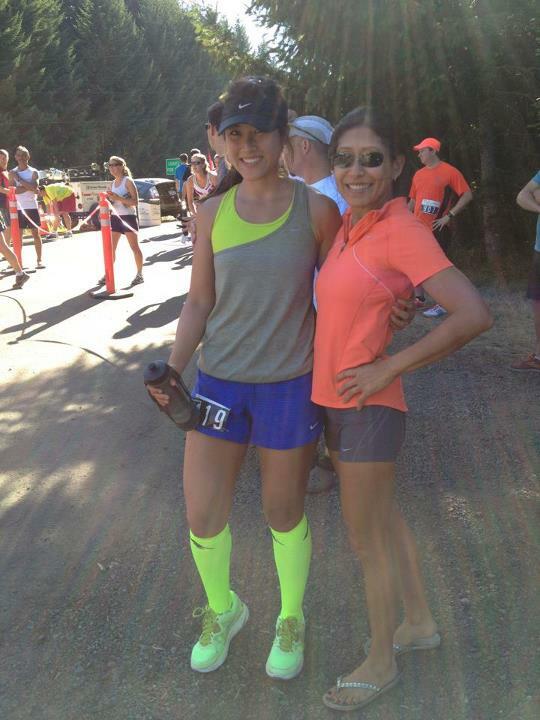 By the time my turn came and being the last runner in the van, I was more than ready to run. Our van was way ahead of schedule (due to the downhill legs) and since we couldn’t finish 2.5 hours faster than our projected estimated finish of 28 hours, Jack bought back some time for us by sticking to his 7:30 pace. I covered 6.75 miles with a few rollers in the beginning followed by a downhill the last 2.75 miles in 54:27, 8:04 pace. After 4 previous relays, I knew the legs would just get harder and harder from sitting in the vans for so long and general tiredness. We weren’t in a hurry and just enjoyed the lush scenery of Oregon with views of Mt. Hood in the back. When our leg was done, we got to meet up with Van 2 for a bit before they had to take off on their legs. Our van decided to not mull around the exchange area and headed straight to the next major exchange even though it wouldn’t be for a couple hours. The next exchange was in Downtown Portland so we had no problem finding a casual place to eat. 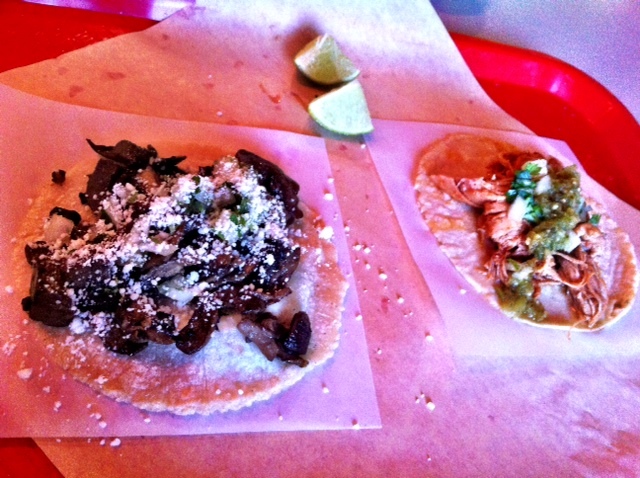 Someone mentioned they wanted tacos and after a quick Yelp search, found Robo tacos, some of the best tacos ever from a total hole in the wall place! Great running fuel (minus the beans). Not to mention, they are normally open until 3AM! What was funnier was that random people would come up to them to take pictures. Desperate times calls for desperate measures. I stayed nice and cozy in the car with a seat that refused to recline so didn’t get much sleep. 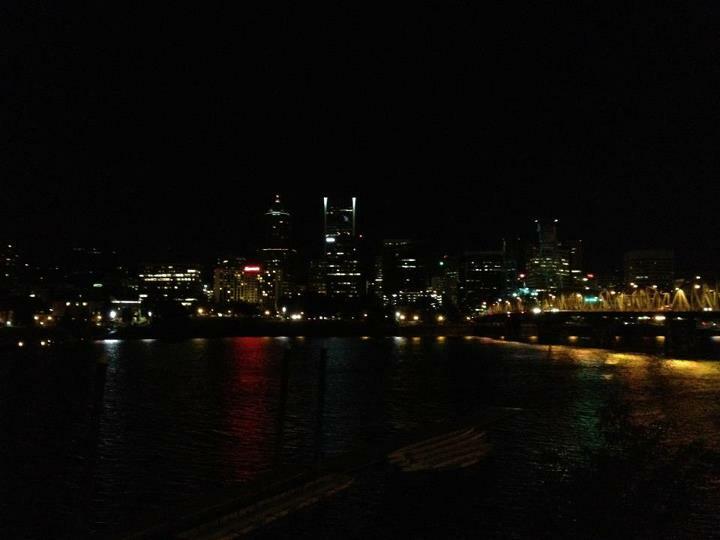 We started back up around 10PM with the gorgeous views of downtown Portland at night. Night time reflectors with vest, headlamp, tail light AND front flasher! 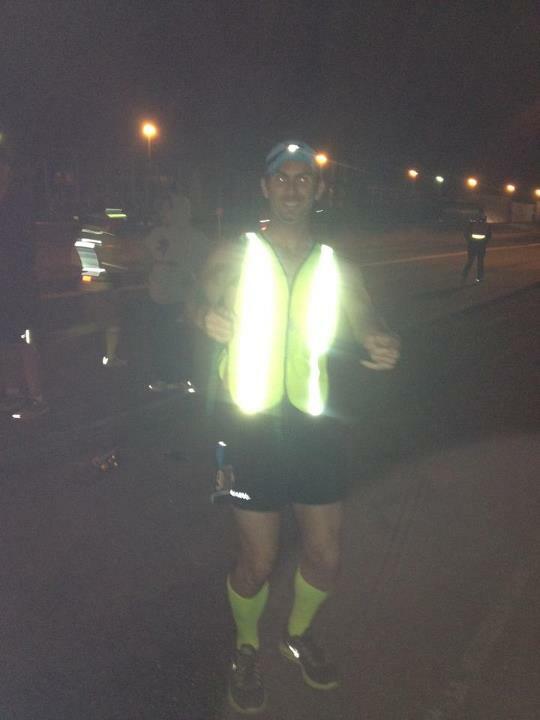 Dave preferred to go shirtless under the reflective vest. Our van ran from Portland to St. Helens and this is where we started catching up to a lot of the other teams that had started earlier. Cue in MAJOR TRAFFIC JAM! The road became one lane and all the vans were just trying to get through and find parking. Luckily we made it to all of our runners in time but Van 2 wasn’t so lucky. I started my 2nd leg close to 2AM and couldn’t get myself to stay awake. 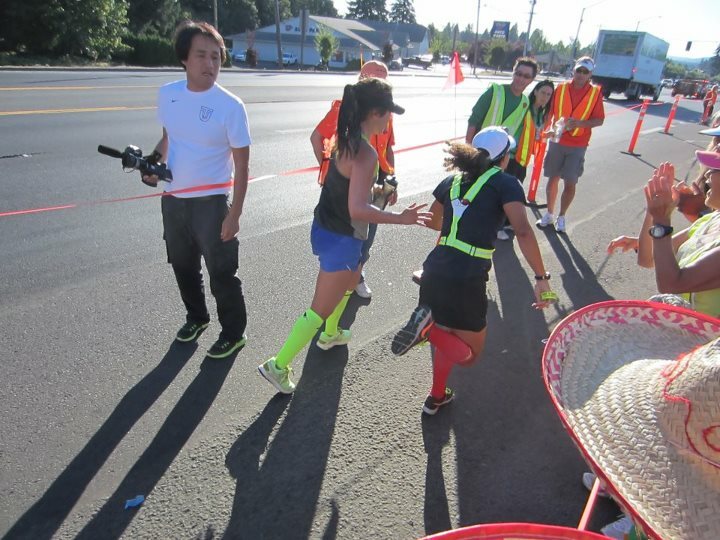 I was trying to get some sleep through everyone’s legs, but it’s hard when the van is stopping and going and you’re trying to cheer on your teammates at the same time. I only had 5.23 miles to run with a steady gradual incline the whole way. Finished in 44:19, average pace 8:28, not the best time, but helped towards getting us closer to our projected finishing time. Once I was done, we headed straight for the next major exchange in Birkenfeld. I took over the driving duty since Jack had been driving almost the whole time and ran into our first major major traffic jam. The traffic was so bad that runners would be passing the vans. This was Van 2 route and people were just jumping out of their vans trying to catch their runners. We were probably going 1 mile per hour, not even exaggerating. I would literally put the car in Park, shut my eyes for a few minutes, before scooting 100 ft up. 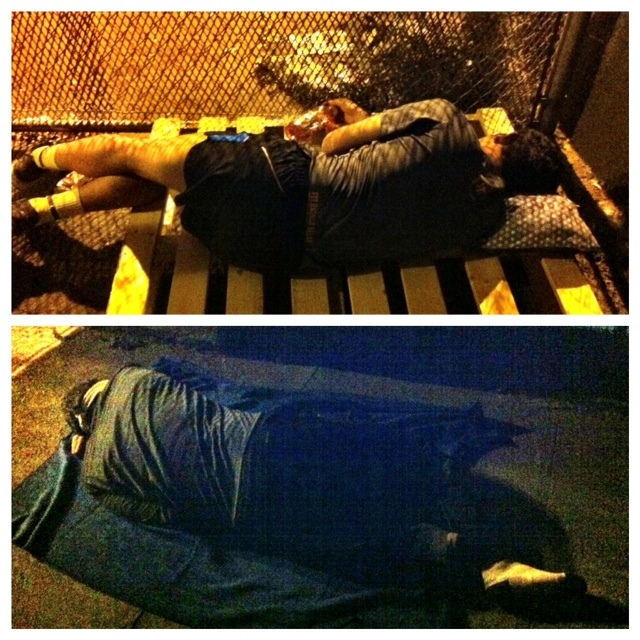 It was ridiculous and we just wanted to get to the next exchange so we could sleep. You could just see a line of cars in front and in back of you. 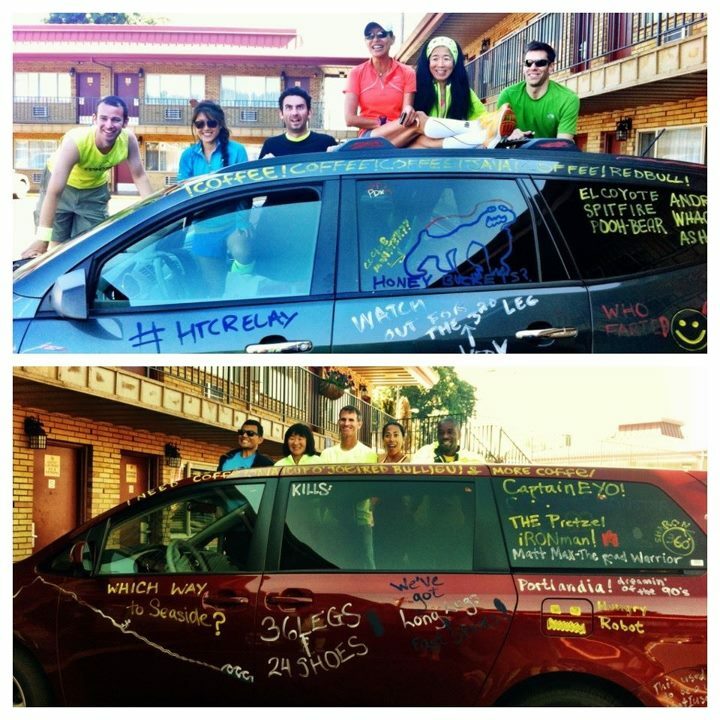 There was no way most of Van 2’s would get to their runners in time. When we finally made it to the exchange point, it was a huge open field so we camped out for a few hours until we had to go again. Our 12th runner came in and Van 2 wasn’t even there yet so Karen ended up jogging backwards to catch the van. Unfortunately for Van 2, for the entire next section they would have to drive alongside all the Van 1’s which caused for lots of congestion along a one lane road. 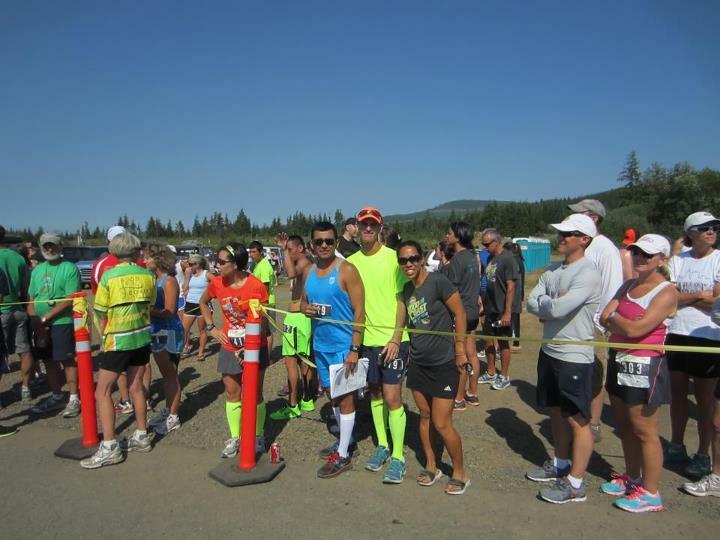 We realized with this heavy traffic, we most likely wouldn’t make it to our runners in time so most of us had to jump out 1-2 miles before our runner’s finished just to get there in time before the van. I ended up running the last 1.4 miles of Jack’s leg to get to my start in time. My last leg was 5.35 miles in 40 minutes, my best leg of all 3. It helped that I was awake for this leg unlike my last one. Our van wrapped up and headed towards the finish in Seaside which we heard rumors was a total clusterf*ck. Surprisingly we scored a pretty good spot in a school parking lot where we rested for a few hours before making our way down to the ocean where the finish line was. The post party wasn’t anything special. I was surprised they weren’t handing out food or anything to the teams and everything was for purchase. I guess with over 1,000 teams, it would be too costly to dole out all that food. 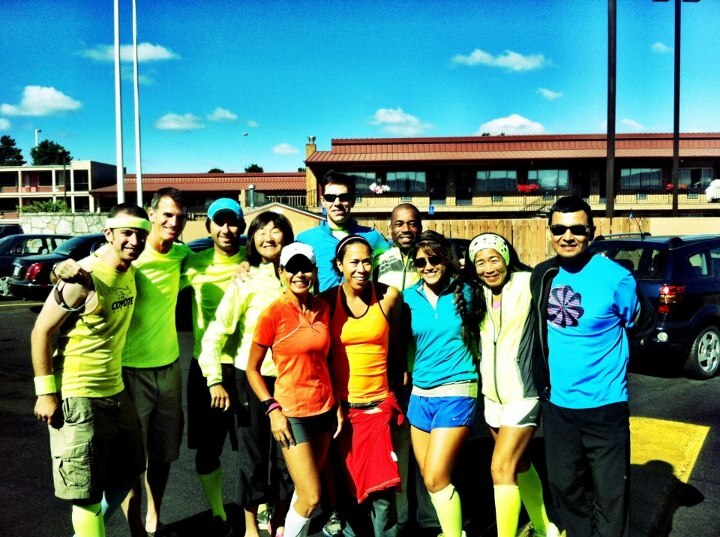 All 11 of us met up right before our 12th runner came in through the finish. It was a happy sight to see everyone finishing together. We had come a long way from the previous day with little to no sleep and lots of running in between. Overall, I enjoyed this experience and getting to spend so much time with a great group of people. I’m glad I get to cross this race off my to do list, though not sure I will be back anytime soon, unless they somehow fix the traffic issue. 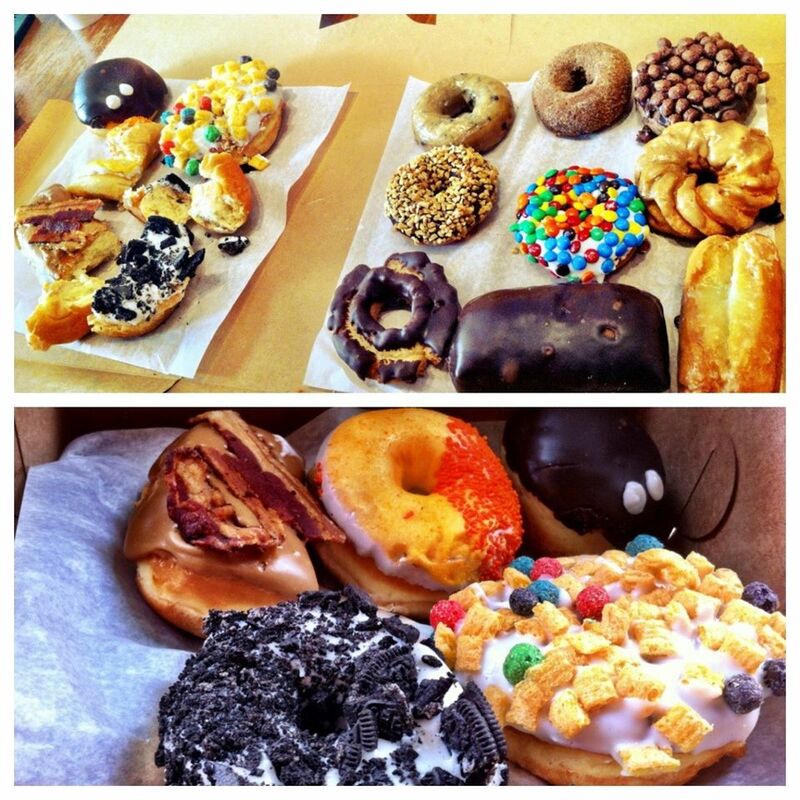 Our Hood 2 Coast reward: Voodoo Donuts! nice recap A! yeah meg told me all about the traffic and how horrible it was! Shocking since the race is so big now…best recovery food ever!